Being a human amidst vampires is hard. Being a woman of a Councilman is harder. Perri has known that vampires existed long before she admitted it out loud. While suffering the loss of the man who treated her like a daughter and trying to build a relationship with Hans, she is quickly entangled in a plot that may destroy the European Vampire Council from within. Hans’ world is falling apart. Lucious and Helena are unreachable, his men are questioning his every move, and he must contain his feelings for Perri to avoid putting her in danger. When he chose to become a Councilman, he never expected that the European delegates would openly declare their defiance. He must find strength within him to protect those close to him. As it stands, his life is not the only one at stake. 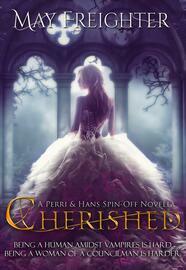 *This novella is a spin-off that tells a story of Perri and Hans from Helena Hawthorn Series. ** This is book #4.5 of the series. *** This novella is Young Adult Urban Fantasy in genre.